Hello Lovelies! So today I thought I would do a post on my evening skincare routine, reviewing the items I use and revealing my previous laziness! From as young as I can remember my mama would tell me to cleanse, tone, moisturise and use eye cream, I would say "yeah yeah" and ignore, but boy do I wish I listened as it is so important. I started wearing makeup at the age of 16, I wore a little bit of mascara and concealer, then at 17 I wore more. My skincare routine was awful! I wanted to take my makeup off as quickly as possible! So I used to mainly use makeup remover wipes and would roughly remove my makeup, scrunching up my eye area! not good! I would never moisturise till I was around 19, and I didnt cleanse till around 20, which was only if I didnt have the wipes! Thats bad isnt it! But the one thing I always did was ensure my makeup was off before bed, which I feel is so important to give your skin some air! Sounds wierd but Ive always thought makeup as a layer covering it from the air! As my mama says "its important to let your skin breath". At around 23 I started doing Virgin Vie makeup consultancy and learnt more about skincare. I had cleanser, toner and moisturiser from the kit I recieved which I loved. I used these products, but not daily as I felt it took time! Then at 24 I would moisturise daily in the morning and at 25 I started buying cleansers and toners, but only ones on offer nothing specific! Never spent a lot on them and sometimes would only cleanse and not tone, and still wouldnt use night cream and eye cream! Dreadful! I began blogging in April of this year, but didnt get into it till around July time. I have learnt so much from the bloggersphere and wish I had listened to my mama from day one! She has stunning skin and doesnt look her age at all! I am 27 and it is showing! I now cleanse, tone, moisturise and use eye cream. I also use face masks and scrubs. I think my skin feels better, it must be relieved! I have always had a great diet of plenty of fresh fruit, veg and water, I feel these are a must for healthy skin as I think that is what has helped me all these years, combine that with a good skincare routine and you are away with the "fab skin" club! 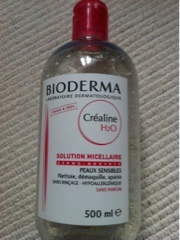 Bioderma- a cleanser that is gentle and takes every bit of makeup/dirt off effortlessly including waterproof mascara! It is perfume free and hypoallergenic. An easy product to use, perfect for every skin type. Mine is combination, but many bloggers who are dry, oily etc use this with positive results. It also has cucumber extract that soothes the skin. A perfect bottle of loveliness! 10/10 with simple clear packaging! 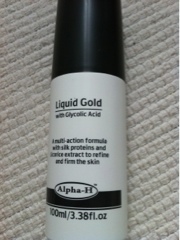 Alpha H Liquid Gold- an item I had heard a lot about, I use this every other night after my Bioderma, keeping this on overnight for an intense treatment. This product contains Glycolic acid which is meant to improve the tone and texture of the skin, working your skin overnight which leaves it tighter and firmer. It slightly tingles when applied, my skin glows and looks brighter! Love this product! 9/10 only due to packaging as feel its a bit bland! But thats just me! 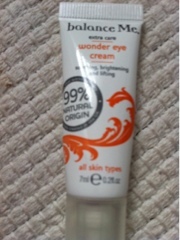 Balance Me Wonder Eye Cream- this cream is beautiful! It smells so gorgeous! A zesty scent that leaves my eye area firm, refreshed and smooth. It soothes any puffiness and has a silky consistency. It states it "helps to revitalise, smooth away dark shadows and reduce the appearace of fine lines." I agree with this statement and am enjoying using this daily! I pat this around the edge of my eye area. The aroma leaves me feeling relaxed with pretty clean lined packaging. 10/10! 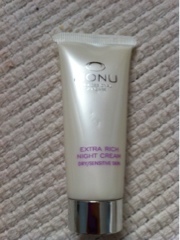 Monu Extra Rich Night Cream- this was a sample I recieved in a beauty box and it is still going! I wasnt sure on the scent at first but love it now! It smells of incense burners with a floral twist. It states it "helps maintain a fresh youthful bloom to the complexion" which I agree with as my skin feels dehydrated, refreshed and soft! Even though its for very dry skin, and I am combination, it is not greasy or oily! Its just right with a silky texture that sinks into the skin. Packaging is simple and clean. 9/10. 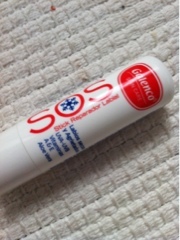 Galenco SOS Lipbalm- I have got into a habit of moisturising my lips as part of my skincare routine. I had this in my Joliebox and have loved every minute! It smells sweet, reminds me of shea and peach! It moisturises and lasts quite some time on my lips, leaving my lips soft and hydrated. The only thing Im not keen on is the packaging which I think lets it down. 8/10 due to packaging. What is your routine? Do you use any of the products mentioned? Never tried the etat, you will have to let me know how they both compare! Right, that's it! I've seen so many people rave over Bioderma, you've pushed me over the edge, I'm buying! I'm 27 too and you've pretty much just told the story of my own previous (lack of) skincare routine! It's only since starting blogging that I've been cleansing and moisturising like I should.